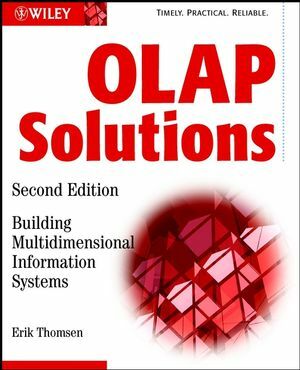 OLAP enables users to access information from multidimensional data warehouses almost instantly, to view information in any way they like, and to cleanly specify and carry out sophisticated calculations. Although many commercial OLAP tools and products are now available, OLAP is still a difficult and complex technology to master. ERIK THOMSEN (ethomsen@dsslab.com) is Chief Scientist at DSS Lab, Inc., where he consults on the design and implementation of OLAP-based decision support systems, teaches at corporations and universities, and conducts research in the field of unified information systems. He also writes the "Analytic Solutions" column for Intelligent Enterprise. He is a coauthor of Microsoft OLAP Solutions (Wiley). PART ONE: THE NEED FOR MULTIDIMENSIONAL TECHNOLOGY. The Functional Requirements of OLAP Systems. The Limitations of Spreadsheets and SQL. Thinking Clearly in N Dimensions. Introducton to the LC Model. The Internal Structure of a Dimension. Practical Steps for Designing and Implementing OLAP Models. Introduction to the Foodcakes Application Example. Appendix B: Standards in the OLAP Marketplace. Appendix C: LC Language Constructs. Appendix E: The Relationship Between Dimensions and Variables. Appendix F: Toward a Theoretically Grounded Model for OLAP and Its Conection to the Relational Model and Canonical Logic. Appendix G: Codd's 18 Features.